Five Star Landscape is proud to be one of the premier full-service insured landscaping companies in Fort Worth. We believe that a job worth doing is a job worth doing correctly the first time. That’s why we take our time with all our projects to ensure they are as flawless as possible and as close to the customers’ desires as can be. Our roots are in Fort Worth. That’s where we dedicate our time and attention, working directly with community and property owners. We are a respected authority in the industry but also know that our clients most appreciate our integrity and professionalism. Not to mention, we only supply high-end plants and materials purchased locally in Dallas/Fort Worth so we know we are getting the best quality products that ultimately are invested back into our city’s growth. Thank you for visiting our site. We invite you to browse and get to know our company and we look forward to helping you create your beautiful landscape. 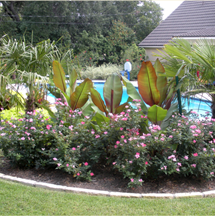 "Our company has been using Five Star Landscape for quite some time now. We are so pleased with the work they do for us. It is such a comfort knowing our landscaping needs are met and maintained on a very professional level and always a beautiful site for us to enjoy. Thank you Five Star Landscape!"